I like snacking. There are no two ways around this; finger foods, salty snacks, candy, pickles, grapes, cut veggies -- I love them all. Well, and to be fair, I especially love salty snacks. Chips, tortillas with guacamole, pretzel bites with flavouring: I would try to survive on these alone and indeed have had dreams to this effect. 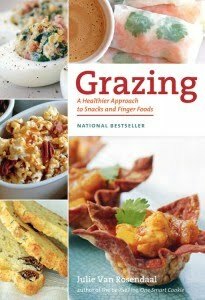 So when the cookbook titled Grazing crossed the desk at work, it was an automatic take-home for me. If I'm going to subsist entirely on snackfood, I should probably make an attempt at healthy snackfood. Cookbooks like this are excellent for the recipes but also for the ideas. The "oh yeah, I could use that leftover pita that is going to moulder on the counter to make delicious and longer-lasting pita chips!" moments abound in this one. The recipes go from the really easy -- pita chips would rank as one of the easiest -- to much more involved, like Vietnamese rice paper rolls, for when you want to impress your friends with your snack-making prowess. I recently attempted homemade crackers, a flax seed wafer cracker that ended up looking like something I might buy at a high-end grocery store in a fancy box, and tasted lovely although probably would have been even better if I'd added a touch of salt to the top for seasoning. They're a little nutty, a little sweet, and definitely delicious. The same recipe can be adapted for sesame-parmesan wafters, which will probably be my next outing in an apparent attempt to make them less healthy. Seriously, though, it was extremely easy and despite my habitual anxiousness when trying a new recipe, I think they turned out really well. I can see making these regularly so that I have something to munch on hand at all times. Add all the good things a good cookbook should have, including nice photos, easy-to-follow directions, good descriptions of what you're making, lots of alternative ingredient options, conversion tables and a complete index (both by recipe title and ingredient) and we have a cookbook that I will be purchasing shortly. Recommended for habitual snackers with a vested interest in avoiding arteriosclerosis, high blood pressure, and all those other good things that come with a steady diet of store-bought potato chips. I'll definitely have to keep an eye out for this one. Grazing right now, so I'm not very eloquent, but it sounds like a lovely cookbook. This looks great. Sounds like one I could ad to my collection. Bookwyrme - I think it was reprinted just last year, if I'm not mistaken, so it should still be available at bookstores and/or libraries. Good luck! It's a good find. I hope my library orders this! It looks like it would fill a useful niche. I'll put in a request. Thanks for the review! Darla - It is a little different from anything else I've found, it's true! I have my own copy now. The library wanted it back. Heh.